Is this a realistic question? There are a couple of problems with this question. The first major problem is this: What person, anywhere, under any set of circumstances, has ever asked a teacher to take a 20% pay cut of any kind? Who are we actually talking about here? I suspect the 20% statistic comes from some kind of fuzzy math. A quick Google scan reveals this story and this story. Both refer to the same situation, and neither story provides any kind of breakdown of the supposed 20% salary cut. They do, however, both refer to a "reduction in pay and benefits" (emphasis mine). I suspect that by including "benefits" (which covers things like the pensions of retired teachers, i.e. not salaries) they have over-stated the total value of the cuts. This sort of tactic is typical of partisan politics. Whenever you see a reference to income that includes some percentage value, your economics siren should start to go off a little. Percentages are a good way to mislead people about the reality of any given situation. Now, this next statement is important: I see no reference to political parties nor any reference to millionaires in either of these news stories. Do you? As you can see, if you begin with one grain of sand and add one at a time, you will never arrive at an exact number of sand grains that constitutes a heap. This is because "a heap" is purely a matter of perception. If you start with a million sand grains, you will certainly say that you are looking at a heap. But by removing one sand grain at a time, you will never reach a point at which you can say, "By removing this last, final sand grain, I am no longer looking at a heap, but if I add it back, it will be a heap again." Let us first take a look at teachers' salaries. What kind of person would suggest that teachers do not deserve to earn $40,000 per year? If we agree that they deserve $40,000, what kind of person would suggest they do not deserve $42,000? If we agree that they deserve $42,000, what kind of person would suggest they do not deserve $47,000? If we agree that they deserve $47,000, what kind of person would suggest they do not deserve $52,000? If we agree that they deserve $52,000, what kind of person would suggest they do not deserve $60,000? If we agree that they deserve $60,000, what kind of person would suggest they do not deserve $66,000? Next, let's have a look at a tax increase on millionaires. 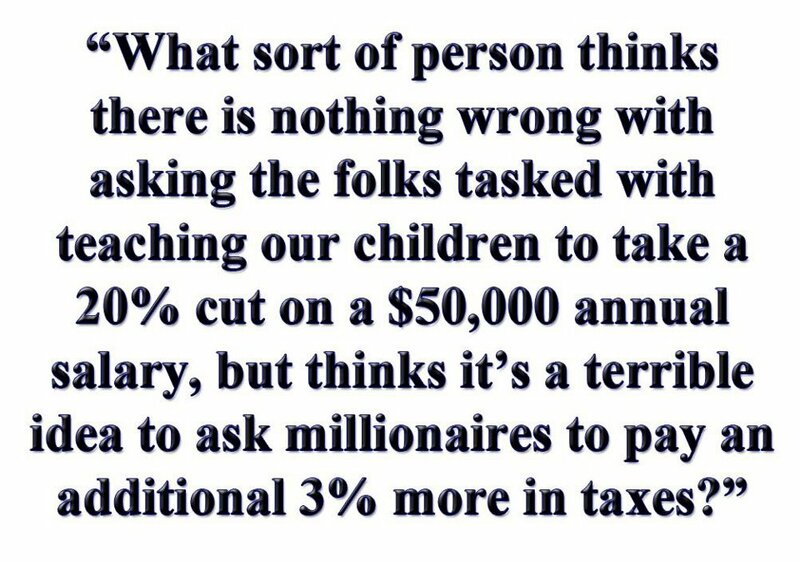 In order to afford essential social services, what kind of person would suggest that millionaires should not accept a 1% tax increase? If we agree that a 1.0% tax increase is okay, what kind of person would suggest that 1.2% is unfair? If we agree that a 1.2% tax increase is okay, what kind of person would suggest that 1.8% is unfair? If we agree that a 1.8% tax increase is okay, what kind of person would suggest that 2.3% is unfair? If we agree that a 2.3% tax increase is okay, what kind of person would suggest that 3.0% is unfair? 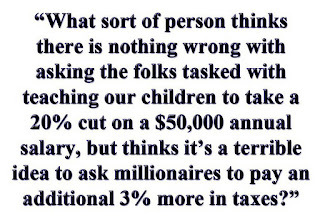 If we agree that a 3.0% tax increase is okay, what kind of person would suggest that 3.5% is unfair? If we agree that a 3.5% tax increase is okay, what kind of person would suggest that 4.1% is unfair? Mises wisely noted that if one embarks on a path of giving one group of people a price or wage increase, one must be ready to set the exact price or wage. You may ask why it is necessary to provide an exact number. The answer is found in the Paradox of the Heap. If we do not define what number constitutes a heap, then we have no reason to believe that one more sand grain, or one less dollar changes the condition of things. Those who favor higher wages for teachers at the expense of higher taxes on millionaires are guilty of falling into the Paradox of the Heap, not once, but twice. First, they believe that teachers require incrementally more money; second, they believe that millionaires will not be significantly impacted by incrementally higher rates of taxation. But how do they know? What is the exact salary that teachers "should" be paid? What is the exact tax rate that millionaires "should" owe to the rest of society? The free market determines wage rates automatically, based on consumer preference. If consumers prefer iPhones to history lessons, they will reward Steve Jobs with more of their money than they will reward an innovative history teacher. However, if we take these decisions out of the hands of consumers and place them in the hands of governments, we must be prepared to provide an exact number, an exact value for what the appropriate salaries and tax rates "should" be. Finally, if we are prepared to provide such a number for teachers' salaries and millionaires' tax rates, why are we not also prepared to provide an exact tax rate for teachers' tax rates and millionaires' salaries? And what about automobile mechanics and computer programmers? What are the exact salaries and tax rates for those positions? We must acknowledge that these endeavors are not just vain, they are completely unfair and arbitrary. Society will never agree on an exact value for any one of these numbers. That is the nature of subjective value judgements in a dynamic economy. The parallel doesn't really work though, because we live in a world where teacher salaries do not respond to the open capitalist market. You point out some great logical fallacies - but what is the answer? Do you really feel that it's a good idea that our teachers are paid a low middle class wage, and then we expect the best teachers to stick around? But Cory, don't you understand? How do you know that teachers' current salary is inadequate? By what measure have you reached that decision? How do you calculate what the correct wage is, if it is not the current wage? What about me? Do I make enough money for what I do? What salary should I make instead? Here's another question for you: How much of a tax increase are YOU willing to pay in order to increase teachers' salaries? How much less should you make in order to increase teachers' salaries? Don't you find it humiliating that teachers' salaries have to be subjected to the democratic process? Should your income ever be voted on?